HomeTown Health, in its 19th year of serving rural hospitals, identifies key leaders annually for recognition. These leaders are vital members of their hospital teams - aiding not only their hospital's survival, but helping their facilities to thrive as well. HomeTown Health, LLC held its 19th Annual Fall Conference at Callaway Gardens in Pine Mountain, Georgia, October 17-19th with over 200 hospital members and business partners in attendance. The Fall Conference includes breakout sessions and presentations from industry experts, established public figures and healthcare leaders on a local and state level. Additionally, it is a time where HomeTown Health recognizes key employees for their success at their facility during the previous year. Jefferson Hospital in Louisville, Georgia was named the 2018 HomeTown Health Hospital of the Year. Jefferson was chosen for providing exemplary leadership by adopting “Best Practices” for rural hospital improvement, and making a commitment to staff education, advocating to state policymakers while emphasizing technological advances and superior patient care. Angela Ammons of Clinch Memorial Hospital, was recognized as the recipient of the 2018 CEO of the Year award, for exemplary leadership and dedication to patient care, employee excellence, and efforts leading to the survival of Clinch Memorial Hospital in Homerville, Georgia. Ted Short, CFO at Fairview Park Hospital, as the recipient of the 2018 CFO of the Year award, “This award is presented each year by HomeTown Health to Chief Financial Officers who exhibit extraordinary talents and skills in positively influencing the delivery of rural health care in Georgia. Ted is someone you need to know, his understanding of the industry, how it has changed, how it keeps changing, and how rural survival is possible is unmatched – he has dedicated his work for many years to the financial sustainability and success of his hospital." Angie Radford, RN from Wills Memorial, was recognized as the 2018 CNO of the Year, for providing exceptional leadership by adopting “Best Practices” for rural hospital improvement, for her well-established commitment to staff education and leadership development, and her dedication to superior patient care while emphasizing technological advances at her facility. Vision Biomedical Services, led by Greg and Melissa Herndon, was nominated by multiple hospitals for their great work as a HomeTown Health Business Partner, and received the Business Partner of the Year award. “This coveted award is presented each year by HomeTown Health to one of 60 Business partners who exhibit extraordinary support and dedication to HomeTown Health hospitals, commitment to excellence, exceptional customer service, and for their tireless efforts in helping rural hospitals survive,” said HomeTown’s CEO Jimmy Lewis, “Mutliple hospitals within our organization nominated Vision Biomedical, which speaks to their commitment to their hospital partners within HomeTown Health. In addition to the awards presented, HomeTown Health recognized the graduates of its 2018 Leadership Development Program. The HomeTown Health Leadership Development program is designed to better equip the rural hospital industry with leadership to transform into tomorrow’s health care delivery system. Each year, hospitals nominate outstanding leaders from within their organizations for this intensive study and professional development program focused on providing them with skills and information to better serve their hospital in the future. Angel Malone, Account Representative, Quadax, Inc. HomeTown Health is an organization of over 70 hospitals throughout the Southeast United States, with additional services through grant programs and education that spread nationwide. 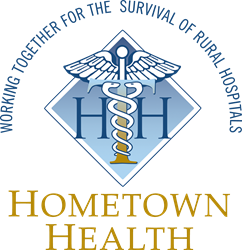 With a focus on rural healthcare, HomeTown Health offers services, education and resources to hospitals which serve rural populations, who are located in rural areas, and who face unique challenges as healthcare providers based on their location, classification and community size. Learn more about HomeTown Health at http://www.hometownhealthonline.com and more about its online education at http://www.hthu.net. Additional photos of awards winners are available on the HomeTown Health Facebook page.